I got married! Sarah and I tied the knot on the 10th August this year. 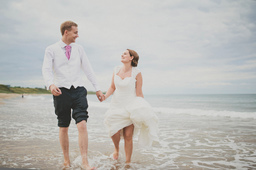 We married in a registry office where we live and had an evening reception on Tynemouth beach. A fantastic time was had by all. We honeymooned in Sorrento, Italy, which was fantastic. We spent one day visiting Pompeii (my fourth visit: about 6 hours on our feet this time, and we walked from one side right to the other); another day in Herculaneum (my second visit); one day visiting the village near where we were staying, where we visited a local food festival and bought the nicest Marmelade I've ever tasted; a few day and evenings in Sorrento town itself; but most of the time we just relaxed, swam, snoozed, read.